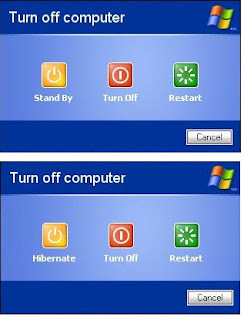 All of you may have already be aware of Hibernate command in Windows XP, which is available in Shut Down menu when we press Shift Key. But unfortunately, this command appears when we press Shift key and the Standby command get disappear. We can see only one button in a time. 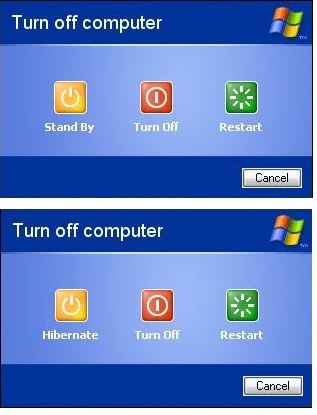 Some years ago, I have seen Hibernate as an additional button in Shut Down menu when I was repairing a Toshiba Laptop. Windows XP OEM version was pre-installed in that laptop. I got wonder when I had seen Hibernate as 4th button in Shut Down menu. I google a lot to find a solution for myself too but get no results. After a few months, I was googling on same topic and I found the solution. So here I am sharing that utility with you and I hope you will like it as well. The following package contains two files. The first file is a registry modification key and second file is an application. After installing the second file, restart your computer and you will notice a new button in Shut Down menu as above. The package is in .RAR format and you may need WinRar to uncompress the file.